It's official! Hudson has made the complete transition from crib to bed. It was a bit of a long road because Hudson's climbing and escaping skills will probably one day help him get into the Navy Seals. So, the way our house was setup was the twins were in a big bedroom together and Chatham was in a smaller room right next to it. Adam's office and our master are off in a separate area. Hudson has previously gotten out of the pack n play randomly way back in April/May and we thought that was the end of the crib for him. But luckily (not really) he ended up getting sick and it kind of nipped the crib jumping in the bud. He stayed in the crib up until about a month ago and that was when I realized it was time to officially switch him. A lot of people have asked why I didn't just switch both twins into beds at the same time and what I've learned is there is no rush! Yardley is in no rush to get out of her bed and I am in no way ready for her to switch out. Plus, I thought having one toddler transitoning at a time would be easier on us and them. So, we took the front part off the crib and added the safety side rail. Things weren't too bad until about 3 weeks into the transition when Hudson learned he could climb into Yardley's bed. At first, it was adorable, they would laugh and squeel and eventually fall asleep in her crib. Then, 2 nights in a row, Yardley woke up at 4am screaming that Hudson was in her bed. We would go in and put him back in his bed and he would climb right back in as soon as the door would close. So, the week before Chatham's 1st Birthday Party, (when we expecting over 30 people at our house), we had to switch around the bedrooms. The girls would be in the bigger room together and Hudson would have his own smaller room. This included painting the walls and redecorating - but more on that in a later post! A few days after Hudson settled into his room, things finally calmed down. I read the girls a book and put them to bed. Then I head over to Hudson's room. I read him a book and sing him a few songs and then leave him and he's quietly falls asleep. 1. If they climb out once, it's not necessarily OVER in the crib. Put them back in and let them go to bed. Sometimes they are so stunned by what just happened or it was a fluke, and they don't even know how they did it in the first place. You'll know when it's time- they can easily get out of the crib no matter how many times you put them back in. 2. Now that you're child is out of the crib, they'll be looking for the safety and security of a crib when they're expected to go to bed. View their room as a crib. Babyproof the entire room- plug any outlets, hide any cords, attach tall pieces of furniture to the wall, and simply take out any furniture you think they could get hurt on (ie rocking chair). 3. Take out the toys- for a short while, you're adorable nursery may now be a bare room. But for safety and your sanity- it's easier this way. If your child now has access to walk around his room witout you there, make the room boring. I left a handful of books and one stuffed animal. The rest got moved out until he's ready for that. 4. If you think your child won't be easily able to cimb in AND out of his new bed, skip the bed for now and place thir mattress traight on the floor with one side up agaisnt the wall. It will still be comfy with a blanket and pillow and a lovey. 7. Use this new time to break any unhealthy or difficult habits. It's easier now that your making this new change. 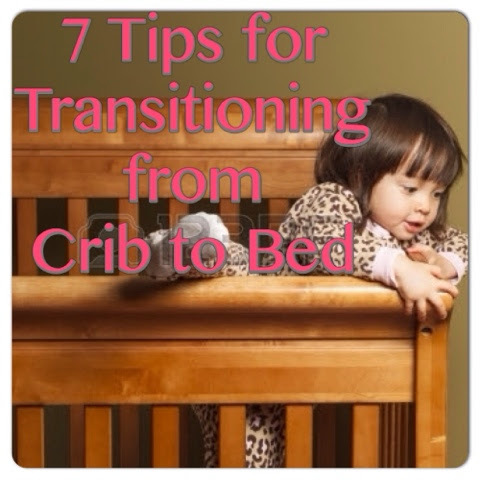 For instance if you typically still rock your toddler to sleep or you still give them a bottle to sleep, now may be the perfect time to transition out of that.